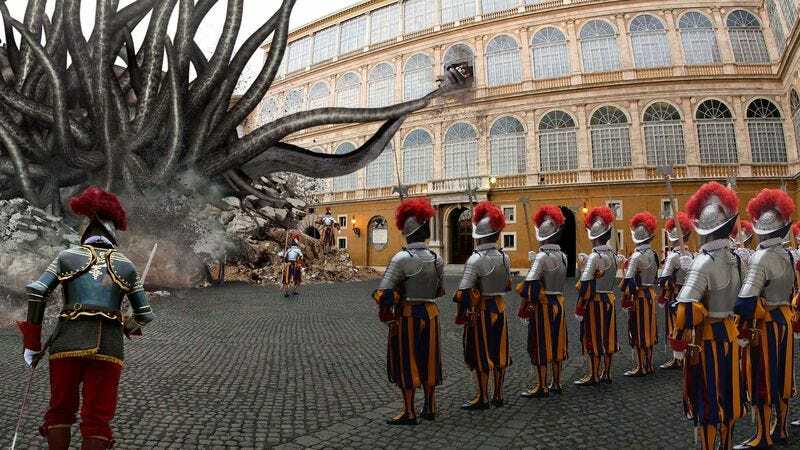 VATICAN CITY—Racing frantically through St. Peter’s Square toward the sound of the Supreme Pontiff’s agonized cries, members of the Vatican’s Swiss Guard reportedly charged and surrounded a colossal writhing mass of black tentacles Wednesday that was devouring Pope Francis. “Destroy the infernal monstrosity,” shouted Swiss Guard commander Christoph Graf, who screamed orders for his men to aim their halberds at the creature’s heart as two of its powerful, ooze-slickened appendages constricted around the pope’s waist and neck and repeatedly slammed him against the plaza’s cobblestones. “Make haste, before His Holiness is torn asunder by the dark horror.” At press time, a member of the Swiss Guard reportedly plunged a holy water–soaked dagger into one of the creature’s eyeless black sockets, causing it to emit a shuddering hiss and crumple back down into the shadowy chasm from which it had emerged.